Some time ago an interesting product crossed my path: a set of isolation stands engineered in Germany by Matthias Kurz of Solidcoreaudio. Hoping that they would be ideal for decoupling the top-plate of my Garrard 301, I requested a set for review. A package arrived promptly, with the stands (perhaps better supports or bases) beautifully and securely presented. 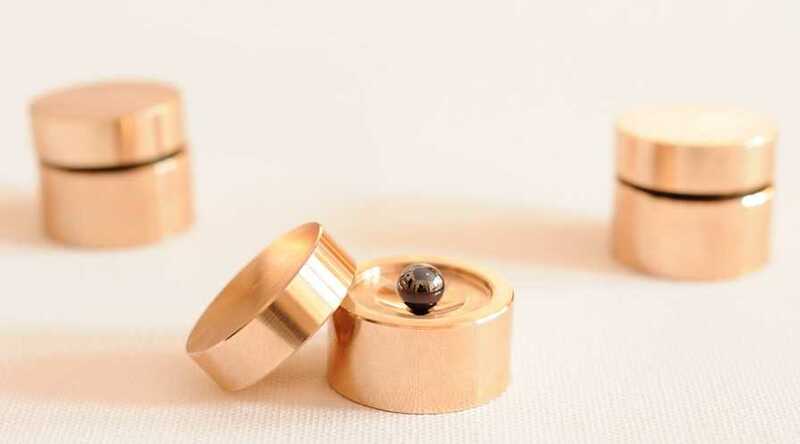 The stands consist of three sets of two bronze discs (each 31 mm in diameter) and one 8mm ball-bearing. 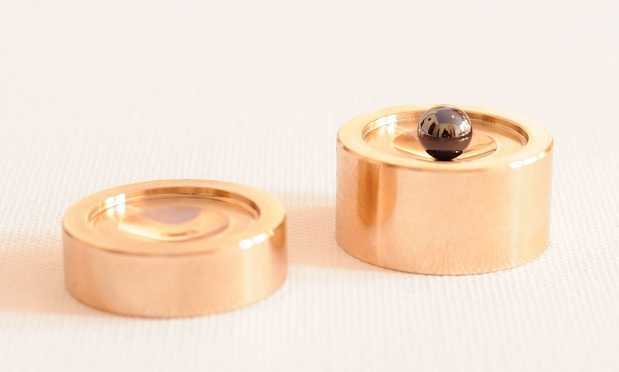 One of the discs is a little thicker than the other and this forms the base, with the thinner resting on the bearing and then supporting part of the unit being isolated. (Other sizes can be supplied on request.) The discs are beautifully polished and pleasing to look at. I rushed home to try them on my turntable, but found them to be unsuitable for this application. Instead of absorbing the rumble of the motor, they transmitted it. I guessed that this was because these isolation stands cut out horizontal vibration, but that the Garrard motor produces some vertical vibration too. Whatever the reason, I put them aside and wrote to Matthias to say that I thought I could not do a review and would be returning them. He politely said, 'No problem,' but also asked whether I had tried them with a CD player. I admitted that I had not and agreed to do this before returning them. That was four months ago. I have since experienced a reluctance to part with them, and they are still located under one of my CD players. What is more mysterious is that I still cannot decide whether they make a significant difference to the sound of my players. I just know that I prefer to listen to a CD player when mounted on these stands. Let me explain. Last summer I spent much of my free time learning a bit more about electronics--I think this is useful background for hifi reviewers. I had a couple of valve amplifiers to repair, a modern one made in China and a Japanese receiver from the early 1960s. While learning how to trace the faults and make the repairs, I listened to CDs. Once I got them working, I soak tested them by listening to more CDs. During this time I hardly listened to any vinyl, and I wondered why I was finding CDs so enjoyable. Was it just because of the pleasure of finally succeeding with my repairs? Or was it something else? Then I realised: the CD player I was using had the Solidcoreaudio isolation stands underneath it. Hmm. Wondering if these really were making the difference, I took them out from under this CD player (an old Philips CD624) and placed them under another CD player (Rotel RCD 965BX, with a clock upgrade). I can't explain why, but I gradually lost interest in playing CDs through the Philips, and started wanting to use the Rotel more. This could be explained by the fact that the Rotel is nearer to my seat in my listening room, but I don't think this is it. Because right now I can't bring myself to remove the stands from under the Rotel. And that is despite the fact that using the stands makes the CD player wobble awkwardly when inserting or removing a disc. So, I was not retaining it for convenience. My conclusion is that these stands do improve the sound of a CD player. Somehow, there is a little more fluidity to the music, combined with focus. They do not change the sonic character of the player, they just make it a little more enjoyably itself. A little less distortion, a little more openness, and thus more music. As an engineer, Matthias explains the physics of this: the three supporting points enable the player to 'float' in the horizontal plane. This freedom transforms any distorting solid-borne sound or microphony into benign low-frequency vibration, resulting in clearer, cleaner, more natural sound. The effect is subtle, but addictive. As I listen to Louis Armstrong with and without the stands, all I can say is that I prefer the sound with the supports. Even though they are fiddly to set up and make loading and unloading a little awkward! These are sweet, good looking and useful accessories.